ASU students share quarters with elephants in new study-abroad trip to Africa. The point was to look at one of the world’s last unspoiled aquatic environments from an interdisciplinary perspective, according to Dave White, a professor in the School of Community Resources and DevelopmentPart of the College of Public Programs and Community Solutions., who was the ASU professor on the trip. The other experts were professors from KCL and UNSW, who were experts in aquatic ecosystems, and Claire McWilliams, an instructor in tourism the School of Community Resources and Development. ASU students in the new PLuS Alliance study-abroad trip to Botswana in July stayed at a research camp run by the nonprofit group Elephants Without Borders. The team got to visit elephants in the nearby Abu Camp, a tourist safari destination that has an elephant sanctuary. The Okavango Delta is an unspoiled wetlands area in Botswana. The ASU students in the PLuS Alliance study-abroad trip performed field research, including analyzing the water for oxygen levels and microorganisms. The students and professors in the PLuS Alliance trip to Botswana in July took small bush planes into the Okavango Delta to spend several days at the remote Elephant Without Borders research camp, where there was no internet connection. ASU student Sabrina Lomprey analyzes research samples during a study-abroad trip to Botswana in July. The trip, to research complicated river-management issues, is a new project of the PLuS Alliance. 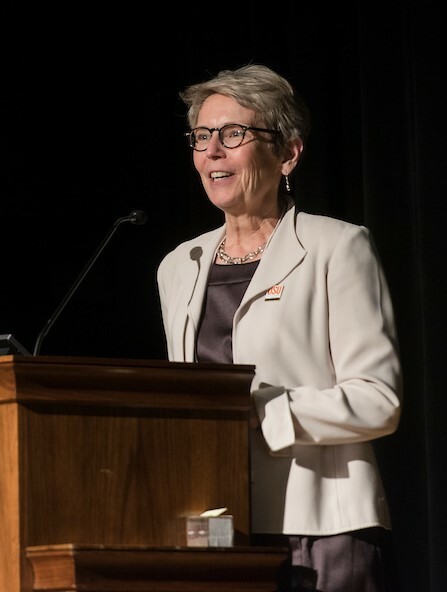 Prior to OSU, Sagers was associate vice provost for research at the University of Arkansas. She also served as a senior research associate with the U.S. Environmental Protection Agency’s National Research Council, and as a program officer for the National Science Foundation’s Office of International Science and Engineering and Division of Environmental Biology. She earned two bachelor’s degrees in biological sciences from the University of Iowa and a PhD from the University of Utah in ecology and evolutionary biology. In addition to her work in KED, Sagers also will be a professor in ASU’s College of Integrative Sciences and Arts.